You fall in love with San Juan del Sur immediately. The fishing village sits on a crescent-shaped bay overlooking the Pacific Ocean. Small boats bob in the calm water. Pelicans swoop toward them in hopes of finding some leftover fish. Open-air restaurants and sandy bars, surf shacks and yoga terraces line the coastal road. Brightly colored clapboard houses stand behind them. The Christ of the Mercy, a massive statue, guards the town high above the bay. While the temperature never strays far from 80 degrees. 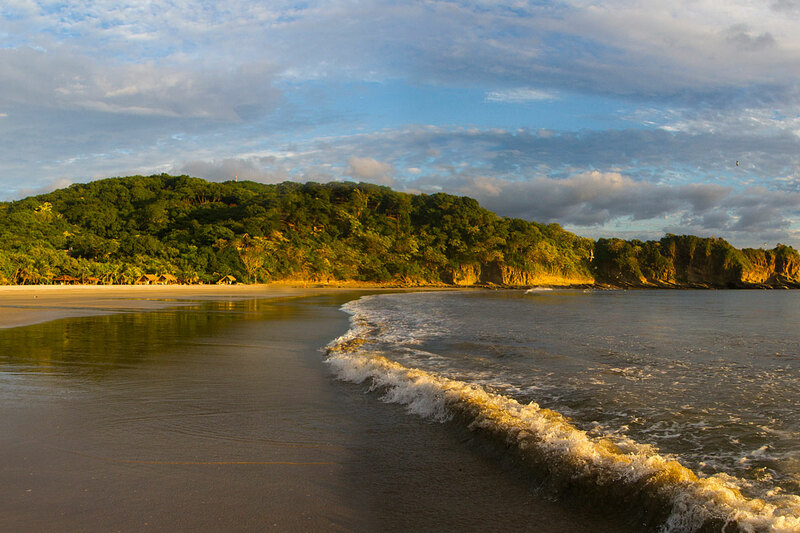 Your new favorite spot in Central America is, amazingly, about to get even better. You’re heading north to find your hotel. The dense jungle is on one side of the winding road. Pristine beaches, where sea turtles are hatching, are on the other. 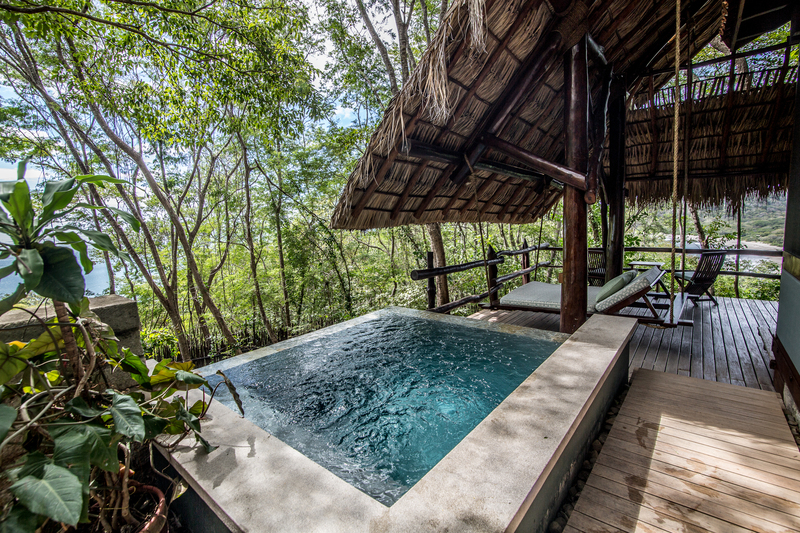 Morgan’s Rock Hacienda & Ecolodge is part of a 4,000-acre wildlife reserve. Your neighbors will be howler monkeys, anteaters, and sloths. The lodge has its own farm, El Aguacate, where most of the food served in its restaurant is grown. It has its own beach, Playa Ocotal, dotted with hammocks, as well. But, to see the best part, you need to cross a 50-meter plank bridge. Your hillside bungalow is across the suspension bridge. It’s comfortable, rustic, and completely open to the elements. There’s a king-size bed and tropical hardwood floors inside. An iPod dock, a water purifier, and a beach bag make you feel right at home. Sliding walls open to a plunge pool, daybeds, and a swing that hangs from marine rope. A tree stump is now a side table. The thatched roof rustles with the sea breeze. While the view extends all the way across the beach. Since breakfast ended hours ago, your visit to El Aguacate will have to wait until tomorrow. Though you usually don’t eat much in the morning, you’re looking forward to breakfast on the farm. You’ll help milk the cows and roll tortillas before eating a family-style feast at the farmhouse. Your mouth is watering for spicy eggs, gallo pinto (rice and beans), and pico de gallo (salsa) already. Lunch at La Bastide will have to do for now. You order shrimp tacos and a Toña beer. They come with a view of the saltwater pool, as bossa nova beats drift from the nearby Commodore Bar. As you lick the garlic and the chili off your fingers, you try to decide how to spend your first afternoon at the lodge. Your thoughts usually go straight to the beach or the spa. The huts with the blue-cushioned sun loungers or a hot stone massage sound awfully relaxing. But you’re feeling more adventurous today. You could take a beginner surfing lesson, so you might be able to catch a wave on your own by the end of the week. You could ride Lucero, a calm horse, through the dry forest, up the hill for a view of the lodge, and back down to the beach. Or you could paddle a kayak up the estuary to search for scarlet macaws, elegant trogons, and graceful herons. But you ultimately decide that all of these adventures can wait. It’s your first day in Nicaragua, and you want to see monkeys. So you board a four-wheel-drive jeep and head out on a monkey quest to find noisy howler monkeys, shy spider monkeys, and mischievous white-faced capuchins. A mojito—made with fresh mint from the farm—your plunge pool, and a perfect sunset will be awaiting your return.